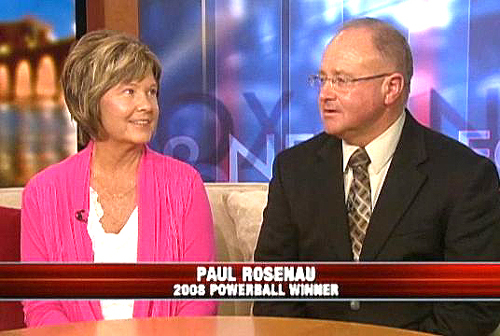 Paul and Sue Rosenau being inerviewed by Fox News. What are they doing now? The winners of Minnesota's biggest lottery win in 2008 - a $180 million Powerball win - were featured in a catch-up interview recently. Took a lump sum of $88 million. After taxes this left them $59.6 million. Didn't move - stayed in Waseca where they have lived for 26 years. Created Legacy of Angels Foundation for awareness of Krabbe disease after losing their grand-daughter to the illness. Pictured soon after their win in 2008. The Rosenau's talk about their win and say they want to keep their day jobs.